C.J. Spiller had 130 total yards from scrimmage Thursday night in Buffalo’s victory, good for better than 46 percent of the team’s offensive output in the win over Miami. But it’s his per carry average that is headed for the team record books. That 6.63 avg. through 10 games is also the fourth highest in the NFL since 1960 among players with at least 100 att. through 10 games. The others with 6.50 or better: Miami RB Mercury Morris in 1973 (7.18, 117-840) & Cleveland RB and Hall of Famer Jim Brown in 1963 (7.09, 204-1,447), and Chicago QB Bobby Douglass in 1972 (6.89, 102-703). 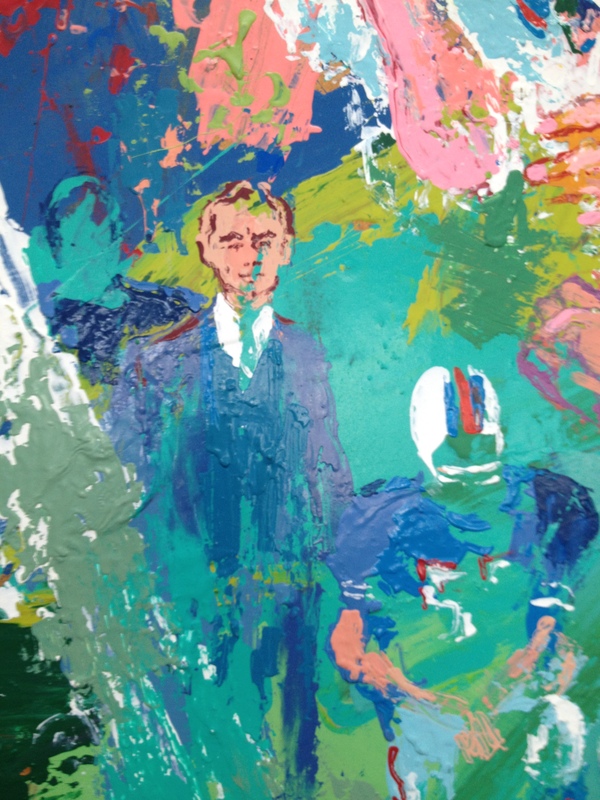 Famed American artist LeRoy Neiman passed away Wednesday evening at age 91. A popular painter of sports action scenes (including 5 Olympiads and countless Super Bowls), Bills owner Ralph Wilson commissioned Neiman to paint one of the first Bills home games the year Ralph Wilson Stadium opened in 1973. 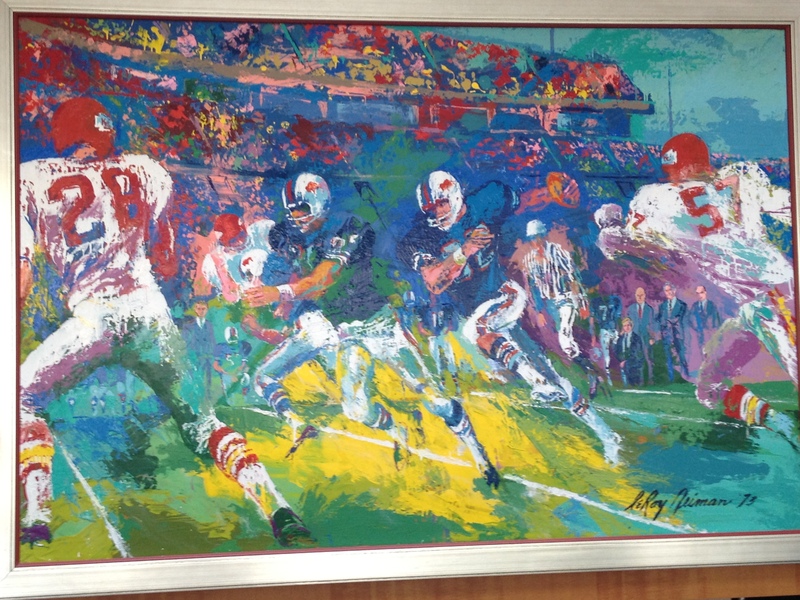 The painting was of the Oct. 29, 1973 home game for the Bills against the Chiefs. O.J. Simpson is depicted in the piece as the ball carrier (see below). Also making an appearance in the painting is Mr. Wilson himself along the far sideline on the left side of the piece (see 2nd photo). The Bills won the game 23-14. Fred Jackson became just the second player in team history to post some pretty remarkable production, and the first is a Hall of Famer. With 120 rushing yards against Washington, Jackson became just the second player in team history to tally 700 rushing yards or more through the first seven games of a season. Jackson has 721 rushing yards after Sunday’s effort. Only O.J. Simpson racked up more yardage in the first seven games of a season rolling up 1,005 in 1975 and 1,025 in 1973. As we cover the Untouchable Bills numbers on the home page of Buffalobills.com today, we thought we’d also take a look at some of the jersey numbers that some notable Bills wore prior to getting the number by which they’re most recognized. We’ll start big with the team’s first Hall of Famer, O.J. Simpson, who wore another number prior to 32. James Lofton, who joined the Bills in 1989 was another interesting case. He had worn 80 his entire career, but that wasn’t the case when he first arrived in Buffalo. Bills all-time leading receiver Andre Reed was issued a horrible number for a wide receiver when he first reported to One Bills Drive. Here is a rundown of some other Bills who wore another number prior to the one they are most identified with. There will be a pair of Bills Hall of Famers that will appear on tonight’s (Thursday) latest NFL Network episode of The Top 100: NFL’s Greatest Players. O.J. Simpson and Bruce Smith will both rank somewhere between 40-31 on episode #7, which debuts tonight (Thurs., Oct. 14) at 9:00 PM ET on NFL Network. Notable figures from the world of sports and entertainment serve as “presenters” for each featured player. O.J. Simpson will be presented by Chuck Klosterman and Bruce Smith will be presented by MSNBC’s Luke Russert. The 10-part series counts down the 100 greatest players in NFL history, as ranked by a Blue Ribbon Panel of football experts that includes current and former GMs, former players, coaches, historians and Hall of Fame voters. Ladies and gentlemen of Bills Nation, I have a humble request if you hold your native hometown and its football franchise sacred. Many times Buffalo, and the Bills for that matter, have been denigrated by an assortment of sports writers over the years. It’s often an easy and convenient way for lazy journalists to fill space in their columns. And S.F. Chronicle writer Bruce Jenkins may be the most misinformed of them all. In a T.O. signing spin-off column he proceeds to insult not only the city of Buffalo, but the history of the Bills franchise, claiming O.J. and T.O. are the only flamboyant stars in the team’s history. Sure he lists some names from Bills history in passing, but he dismisses Thurman Thomas and completely forgets Bruce Smith. Yup, Smith was not even mentioned. You know, Bruce Smith, the league’s all-time sack leader, the guy that’s going into the Hall of Fame this summer? Jenkins also dismisses Buffalo’s history. While the Bills can’t claim the Super Bowl titles of the 49ers in the 80’s, the Bills certainly have a prouder history from the early days. From 1950-1980 the 49ers have only 3 division titles and four playoff appearances. Over that same span minus 10 years (Bills first AFL season was 1960) Buffalo had 3 division titles, 6 playoff appearances and a pair of AFL championships. So please, please send this Jenkins character an email (bjenkins@sfchronicle.com) and set him straight. Tell him the 49ers history wasn’t worth much prior to Bill Walsh, isn’t any better than the Bills history in this decade right now and that he may want to look at the list for Canton this summer and realize O.J. and T.O. aren’t the only flamboyant stars in Bills franchise history.